This event is sold out, sorry! 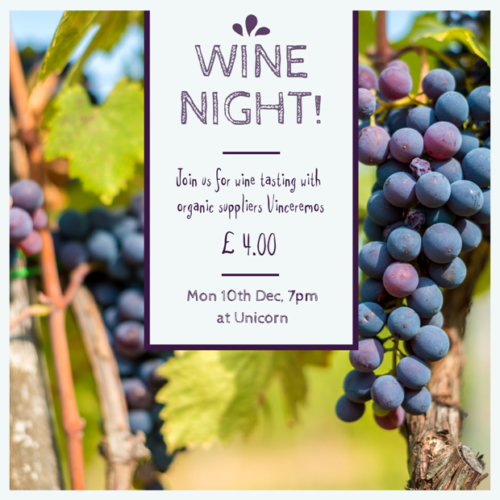 Come and hear the stories behind our favourite products, and meet some of our most innovative and interesting suppliers. As a business, we aim to cultivate stronger connections between our food, its producers, and all of us who eat it. 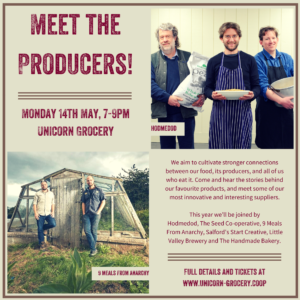 Join us for an informal evening of short talks from some fascinating suppliers who are building a better food system from the ground up, followed by time to chat and sample their wares. There’ll be free soup and bread at our deli, and we’re licensed for the evening so you can enjoy a Little Valley brew or two. Hodmedod, Suffolk-based pioneers on a mission to reintroduce British-grown pulses and grains (and fellow winners at last year’s BBC Food & Farming Awards!). Find out how they’re reviving the farming of products the UK has long-forgotten we can grow. The Seed Co-operative, a trailblazing community-owned seed company who believe passionately in breeding open pollinated seeds that everyone can grow, everyone can save for the next year, and everyone can afford. 9 Meals From Anarchy, organic veg growers turned stock-makers, hoping to eventually make their stocks with all their own Cheshire-grown veg. Everything they do is guided by the conviction that “your meal should be as good for you and as good for the environment as possible”. Oh, and super tasty! Start Creative, a Salford social enterprise using creativity to help vulnerable people improve their skills and gain in confidence. Behind each Start chopping board or bird box we sell lies a story, and the hands that made them belong to someone with a fiercely creative talent borne out of facing difficult social challenges. 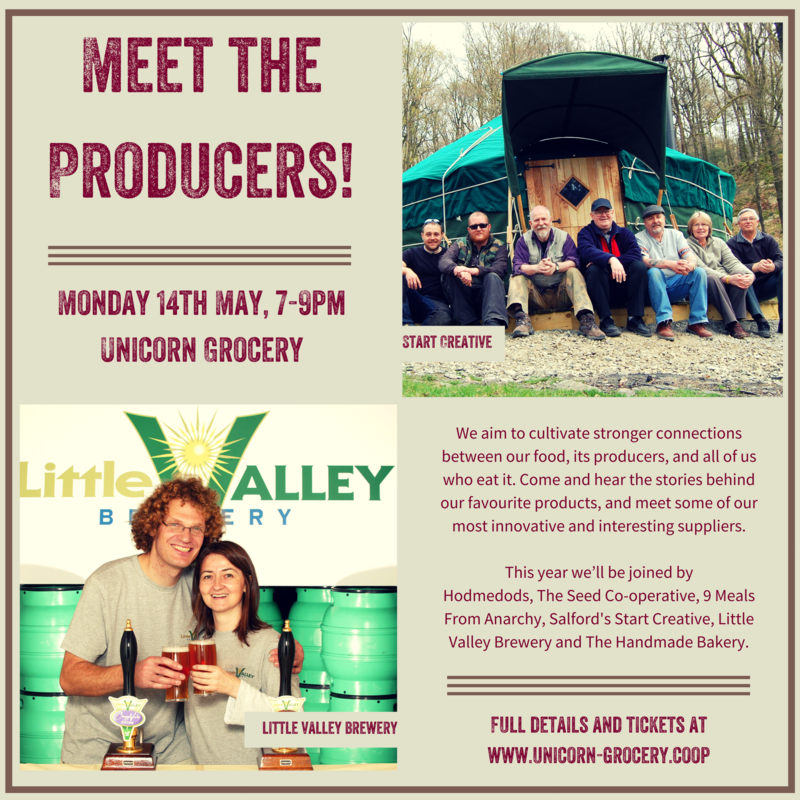 Little Valley Brewery, a family-run business resting high on the rolling hills of West Yorkshire. All their beers are brewed, bottled and branded on the Pennine moorland of Cragg Vale, just outside Hebden Bridge. They use age-old methods and 100% natural ingredients to create a core range of organic certified beers that we love. The Handmade Bakery, a workers co-operative like us, baking the most beautiful bread we’ve ever found. This West Yorkshire enterprise pioneered the idea of the Community Supported Bakery, using ‘bread bonds’ to finance their early development. Still at the heart of their community, visitors to their café can watch the dough being scaled, hand shaped and baked on the sole of the oven each day. Please note, although you should receive a confirmation email when registering online, there is no need to print this out. You’ll simply be added to our registration list and we’ll check you off at the door. Alternatively, pop into the shop and buy a ticket in person!